Predictions have been pretty pointless so far in this topsy-turvy Premier League season but much more of this and people are going to start backing Tottenham Hotspur for a Champions League finish. After the encouragement of the performance, if not entirely the result, in the 1-1 draw at Arsenal before the international break they swatted aside a West Ham United team who have made a habit of rousing themselves for the big away games. Apart from a decent enough opening 20 minutes Slaven Bilic�s team were second best in all areas � particularly defensively � and it was hard to think of any of his players who truly showed their best, apart from the goalkeeper, Adrián. 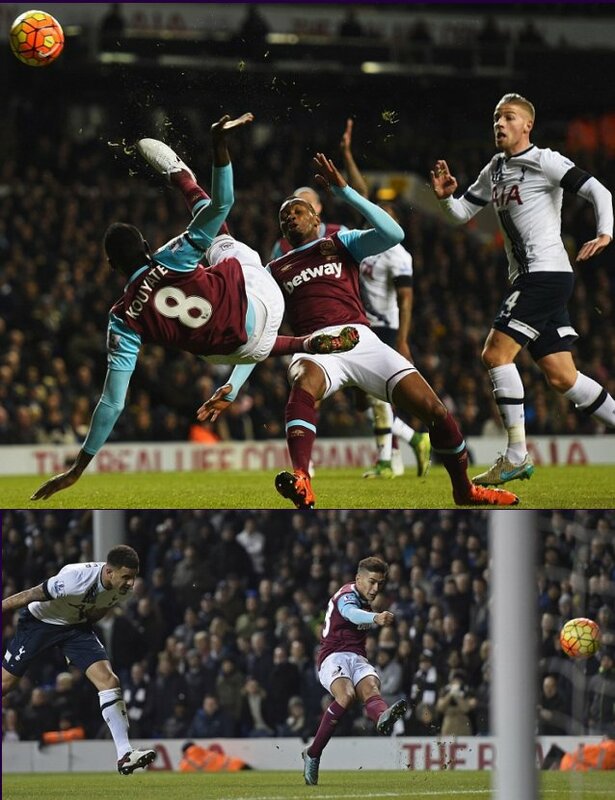 He conceded four times and was at fault for Harry Kane�s second goal but he was comfortably West Ham�s best player. Tottenham revelled in a victory that extended their unbeaten run in the Premier League to 12 matches, a club record. The goals are flowing once more for Kane and the two here made it eight in his last five club appearances. He has scored in his last four league games. Jamie Vardy, watch out. The White Hart Lane crowd shouted they wanted five after Kyle Walker had played a give-and-go with Son Heung-min to curl home the fourth with the outside of his boot for his first goal since December 2013 and it was one of those days when virtually everything went to plan. The only disappointment for Tottenham was the needless booking that Dele Alli picked up after he became embroiled in a row with Mark Noble which had not really concerned him. Alli stepped in to stand up for Kane after a skirmish and he will now be suspended for Sunday�s home game against Chelsea. It was Tottenham�s intensity, their high line and the sheer ferocity of their collective pressing, together with their decisiveness, that stood out. They were quicker, physically stronger and they squeezed the life out of West Ham, whose only response was the late consolation from Manuel Lanzini, a wonderful strike that deserved better than to be relegated to a footnote. Lanzini turned Walker inside then out before he lashed the ball into the roof of the net. West Ham had arrived on the back of their best Premier League start, having won all three of their London derbies this season and with a positive recent record at this stadium. But they unravelled after Kane had opened the scoring and they could have suffered a much heavier defeat. Mauricio Pochettino could be seen urging his Tottenham players to press higher and higher and it was they who earned the right to play their football; West Ham blinked first and then again and again. Adrián had repelled Christian Eriksen�s drive, which took a slight deflection off James Tomkins, when Tottenham went ahead. Bilic could be deeply unhappy with his defenders at various points of the afternoon and the first instance was Carl Jenkinson�s failure to keep hold of Kane. Son worked the ball to Alli and the midfielder�s shot was blocked, before it squirted back off him towards Kane. It was crowded inside the area and Jenkinson appeared to have the position on Kane. But the striker used his strength to roll away from him and thrash a shot high past Adrián. Bilic barely flinched when Tottenham�s second went in. Instead he stood and stared at the carnage that Toby Alderweireld had wreaked inside the West Ham box. It was not difficult to read his stony features. From Eriksen�s corner Alderweireld got the jump on Winston Reid with a quick dart towards the near post and, when the West Ham defender passed him on to Andy Carroll, the alarm bells were ringing. Alderweireld rose in front of Carroll to flash his header home. Tottenham might have had more before the interval. Son threw West Ham�s defenders with a drop of the shoulder before working Adrián and, on the follow-up, Alli put his head in front of Tomkins� high boot to loop an effort against the crossbar. The clearest chance fell to Kane in the 39th minute after a ricochet off Reid but, one-on-one with Adrián, he dragged his left-foot shot badly. West Ham lamented the moment at 1-0 when, after Noble�s shot had looped up and the offside flag mystifyingly stayed down, Cheikhou Kouyaté leapt into an overhead kick and crashed the shot against the crossbar. Tottenham, though, turned the screw in the second half and the third goal followed West Ham�s most excruciating lapse. Tomkins, attempting to play out from the back, rolled the ball straight to Eriksen who shifted it quickly up to Kane. His low shot flicked off Reid and fizzed underneath Adrián, who had to do better. Alli and Noble were booked and so were Walker and Diafra Sakho for more of the same later, but it was Tottenham who smelled blood. Adrián made a double save to deny Son and Eriksen in the 53rd minute and after Lanzini�s goal Tottenham almost got the fifth only for the substitute Ryan Mason�s long-range shot to hit the post.